Identity management costs increase due to custom workflow and programming. Avatier business-driven identity management offers customizable solutions through configuration rather than coding. Avatier agile solutions empower business users and partners to request the access they need when they need it through self-service requests, automated business workflow and a universal client. As technology advances, users require IT solutions to work on any device with any web browser. 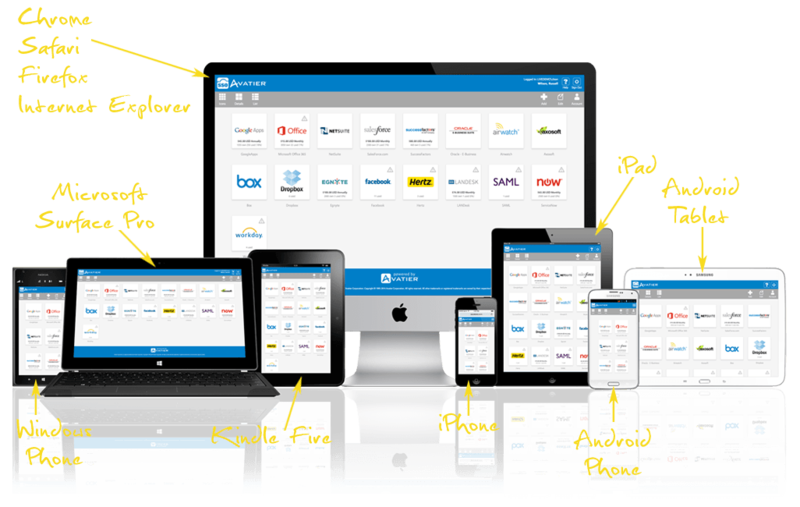 Avatier's unified solutions enable access for business users from leading mobile phones, tablets, and browsers. Avatier offers total identity management software, services, and audit controls that transform how an enterprise operates. The best brands and most secure environments put their trust in Avatier. Critical to a successful identity management solution is the time required to deploy and the cost to maintain. Avatier solutions offer the quickest time to value at the lowest operational costs in the industry. We devote ourselves to the success of each company we serve and every organization we improve. Our customer renewal rate is a testimonial of our value. Avatier's software is designed to exceed military security standards and is constantly being scanned against the latest security vulnerabilities and hacker attacks. "Avatier Identity Management Suite (AIMS) Version 9.x is hereby certified and placed on the Air Force Evaluated/Approved Products List (AF E/APL) IAW AFI 33-210* as application software." In order to make the cyber world a safer place, our elite development staff ensures web application security remains a priority. Administer assignments of things with one system and one experience. Manage the Internet to all identities, system access, cloud subscriptions, facility access, assets, passwords, groups, and even accountability through a unified suite of tools. Avatier solutions are designed to provide your business users with one unified experience by running on any device at anytime and from anywhere. Our systems are highly available, flexible and scale to enterprise operations. Avatier continues improving upon its ongoing vision of risk-driven identity management. By interweaving identity risk analytics, and intelligence into our solutions, our innovation improves decision-making and operations. Empower business users through self-service delegated administration. Automate on-boarding, transfers and terminations. Enable mass enrollment and bulk administration. Avatier delivers with governance. Whether on-premise, hosted SaaS or soon multi-tenant in the cloud, Avatier gives your organization the most agility.